Teju Cole—author and photographer—created Black Paper, a highly political and personal series of photographies, to show us how he sees the world. We spoke with him about this project, his work as an author, rhythm and, of course, Berlin. The interview was conducted by Sophia Lohmann and Sophie Sumburane at the Haus der Kulturen der Welt where Teju Cole is part of the advisory board. Sophia Lohmann: You are widely known as a cosmopolitan writer from New York City. How do you feel about Berlin? Does this seem like a small town to you? Teju Cole: I really enjoy Berlin, its rich culture, its contemporary art and photography—and there’s good hip-hop. Berlin has a diversity of culture that I feel familiar and comfortable with and a special vibe. That’s why it doesn’t feel as small as it actually is. A good measure for your experience of a city is: When you are there, do you feel like you’ve seen it all—or do you always wish for more time? The latter I always do in Berlin. The size of a city is not just its physical size and its population, but also its history. So thinking through these different layers that can be excavated, Berlin may not have a long history as an important city, but a very intense one and I feel like I have been barely scratching the surface. Sophia Lohmann: Your home town is going through an intense time in its history as well, euphemistically speaking. You are responding to the current happenings in world politics but particularly to Trump’s election as president with a multidimensional but very dark photo series on Instagram called Black Paper. What does it mean to you? Teju Cole: What is your answer? How does it feel to be looking at this? What is your general sense of what it’s doing? Sophia Lohmann: To me it felt like a more than melancholic report on the last months made of glimpses and thoughts. They express a tension between movement, flux, a sense of agency and on the other side silence, death, fear and fragments of something very dark and not knowable. I also had the impression that these pictures express something that can’t be said in words whilst the poetic fragments added to some of them are in a conversation with the pictures, instead of voiceovers or subtitles. Teju Cole: Absolutely, it is kind of an immediate, rapid or real time response to the current political predicament. I did quiet a bit of writing, but then I felt like I needed to let the images flow. Sophia Lohmann: Is it a direct response or thought through and selected carefully? Teju Cole: It’s an oblige response, but immediate. If I take a picture today and put #_blackpaper, it’s not necessarily a response to, for example, the firing of the director of the FBI by my president—who is obviously corrupt—and the intensity and disorder that we feel because of it. Any given photo that I post will be more about the general continuing mood and the fact that I feel like the ground beneath my feet is very insecure. Cumulatively, it has something to do with a dark mood, a tempting to interrogate my own psyche as it is going through this moment of political disaster. A private exploration of the very public disaster. Sophia Lohmann: Where will you go with Black Paper and these prospects from now on? Teju Cole: I think it soon will be enough with #_blackpaper on Instagram, but there will be a second and more formal presentation as a large work on a wall, made up of many different pictures, like a cloud of images, printed. That’s going to be Black Paper II. Black Paper III will probably involve sound recording, some video, maybe a performance and projections in a gallery. Black Paper IV might be a book with text and image. It has to be an evolving project but for now it is really focusing on the images and Instagram is my sketchbook. Sophia Lohmann: I’m really curious about the next stages of Black Paper. To be honest, after reading your books and articles I would have imagined a more empowering artistic response to the current political status quo and processes, with Black Paper being mostly gloomy and sad. Teju Cole: It is sad, it’s crisis, allowing these negative feelings to breathe. I cannot empower yet, the disaster is ongoing. This is almost like an emergency emotional response. So the first thing to do is to explore the feeling. If there is more political thought and clarity in known and strange things, I think Black Paper has a lot of the mood of open city. Open City is a bit more glimmering and lighter but they have in common that there are many different kinds of complex imagery. Open City functions much like a collage of literary images and Black Paper is very much a similar kind of assemblage. I feel like I’m a bricoleur of psychological states and I’m collecting whatever belongs to my collection. When I arrived in Berlin for example, I thought I was really done with Black Paper. But then I added two more pictures and I will probably add a couple more, they just belong. It (pictured above—ed.) really looks like theatre, but it’s from real life, in Friedrichshain. I think it was a drug overdose and he was about to die. Sophia Lohmann: Are there certain pictures that are particularly important to you, personally and in the context of the project? Teju Cole: When I look at certain pictures, I just know they must be in the project. Sometimes it’s not necessarily the one you would think of as the most obvious, but it’s the feeling a photo projects. This one for example is an absolutely central image. It’s about these swirling emotions, even though it obviously has nothing to do with politics. And this one from March 31 in the Reichsmuseum Amsterdam, a man looking at Rembrandts The Conspiracy of Claudius Civilis, where people made a plan to overthrow the rulers. Sophie Sumburane: Switching to your literary writing, I was thinking of your essay “Black Bodies” as quite important. There you express your similarity to Baldwin in different ways but also your dissemblence to him as he didn’t want to relate to western culture, didn’t see himself in that context —but you do. In how far could you say you are still like Baldwin or not? Teju Cole: I am obviously not European, I’m American. I am not a white American, but I have had this education. It’s 25 years ago that I came to the US. I got a Bachelor’s degree in art history, in western art, I studied African Art at the University of London and got my Master’s in northern renaissance art from Columbia University. All along this I live in the west and with western culture, but still I’m not a white western. I’m an African, a Nigerian, a Yoruba as well. Baldwin looks at a cathedral and likes it, but he can’t really connect to it because it was built by white people. He describes the same experience with listening to Beethoven, but that is not my experience of Beethoven. It’s amazing! I’m moved by it and I enjoy it because I am a human being and this is a very high expression of human art. The same thing I feel when I watch a film by the japanese Director Akira Kurosawa or if I read a book of the nigerian author Wole Soyinka. I connect to it, because it is extraordinary. I might also connect to it on a cultural level, but that is not required. Sophie Sumburane: Is it a case of literary blackfacing if a white author writes about “Black Lives Matter”? Teju Cole: Black American history is American history; all Americans have to engage with it in a responsable, knowledgable way that is sensitive to the complexities of history. The question for a white American shouldn’t be if you are permitted to participate in this, the real issue is: as a white american you are required to participate, it is your duty. But that duty includes being highly attentive and paying attention to the subtleties. If somebody asks whether Germans should be allowed to write about Jewish issues or about the Holocaust, the answer of course is yes. It is a responsibility to do so with a full sensitivity to the pain and damage the Germans caused. I think white Americans also have to think about African American history that way: sensitive, accurate, but courageous. Sophie Sumburane: In how far have you been involved in the “Black Lives Matter” movement? 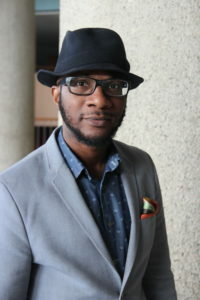 Teju Cole: I am definitely not an organiser, I have been to a few protests and I think it is an important movement. Sophia Lohmann: I was wondering if you feel like having different approaches and ways of looking at the world as an author of novels, as a critic and intellectual and as a photographer. Is there something in your photos that is beyond language and can photos as well be a way to escape from language from time to time? Teju Cole: My photos are known for being combined with texts. I am not taking them to escape from language, I am doing it to do something else. But of course I see the images, even just by themselves, as a kind of language. I express a lot about the world I experience by writing and yet I also have a lot of doubts, whether words can be enough to say what needs to be said. The notion that words are inadequate sometimes is an important underground river inside my photographic thinking, pictures have an immediate and emotional impact. Sophia Lohmann: There seems to be an ongoing presence of movement and rhythm in your work, in every sense of the word: movement as way of live and perception, of thoughts, of bodies. I see both in your literary and your photographic work highly rhythmic elements, would you go along with that? Teju Cole: Yes, that feels like a possible biography of my work, it is indeed about movement and not many people see that. For example my favorite pictures from Black Paper have rhythm in them and that goes for my texts as well, it is a lot about the rhythm in the sentences. What belongs in my work doesn’t depend much on the question of whether this is a nice picture or story. It’s about the rhythm and whether it is coherent. What makes that picture for me? Of course the colours, the set, the people, but also how it communicates with other images, but mostly it is about the rhythm, if it belongs in the larger set, the mood or where I am right now. Sophie Sumburane: A strong motive I see in your literary and photographic work is “show, don’t tell”: Is that a connection between your texts and your photographs? Teju Cole: The photographer Garry Winogrand said: “I photograph in order to see what something looks like photographed.” He is photographing to annotate the world, it is not about photographing a hat because it has any meaning, but to see how it looks like in a picture. If I look at the picture, I see something else, I didn’t pay attention to before. I want to go even further than that. I photograph not to show you what I see, but to show you how I see. What somebody else might consider boring, I am trying to see what could be interesting in it. Showing you what I see can be just telling something, but showing how I see allows someone to shift perspectives and experience different ways of being in the world. That comes down to a kind of ethics in the end.